Giant peanut butter cookies made with whole grain or white whole wheat flour and stuffed with all kinds of good candy. Do not preheat oven yet, as dough needs to chill. With an electric mixer on medium-high speed, beat the butter, peanut butter and both sugars until creamy. Beat in vanilla, egg, molasses and cream (or whole milk). Beat in salt, baking soda and baking powder, scraping sides of bowl to make sure ingredients are evenly distributed. Add flour and stir until mixed. Stir in frozen peanut butter cups and chopped chocolate. Chill the dough for 2 hours. Using about a quarter cup (2 oz) measure, shape into mounds. Chill the mounds until ready to bake or go ahead and bake them. Before baking, decorate tops with Reese’s Pieces. Preheat the oven to 350 degrees F. and line two baking sheets with nonstick foil or parchment paper. Arrange the mounds about 2 1/2 inches apart on baking sheets. 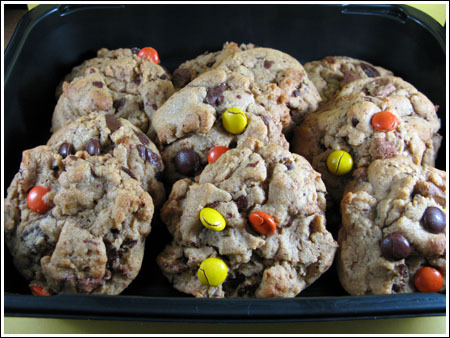 Bake one sheet at a time on center rack for 12 to 15 minutes or until cookies appear set and edges are nicely browned. Let cool on baking sheet for five minutes, then transfer to a wire rack to cool completely. The cook time includes the time needed to chill the dough.